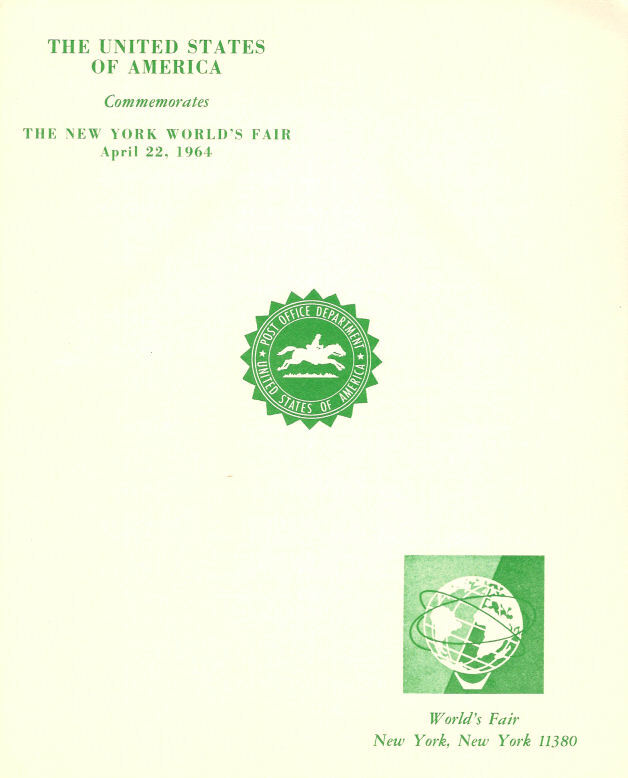 Join us today at nywf64.com to enjoy a major new Feature presentation on the "STAMPS OF THE FAIR," presented by 1964-1965 New York World's Fair collector and philatelist, Randy Lambertus. Postage stamps are, in fact, miniature portraits. Randy's superb presentation is a veritable gallery of World's Fair artwork. 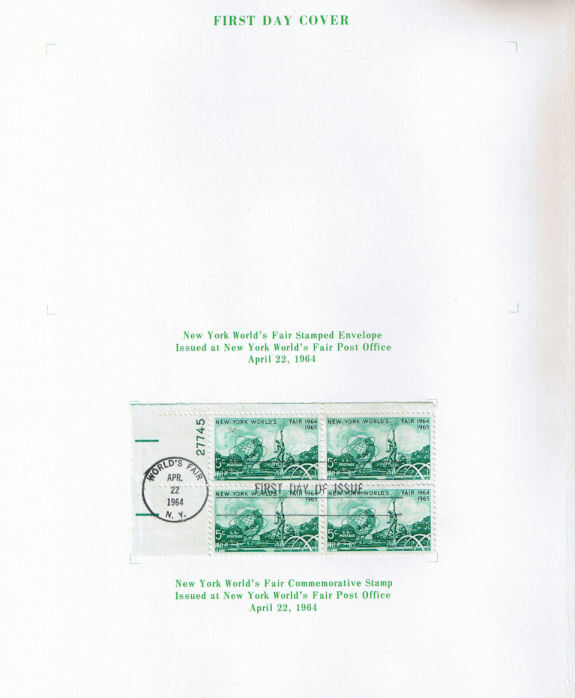 His Feature includes nearly two hundred images of various world-wide postal issues that commemorated the 1964-1965 New York World's Fair. You won't want to miss this presentation! Coming up soon ... watch for new "Wear the Fair!" designs. And nywf64.com will soon have Feature presentations on the Singer Bowl and RCA Pavilions. As always, we appreciate your continued interest in the website and the Fair. Thanks Randy! An often-overlooked subject. And 'cinderellas' like those German Rocket Mail stamps are really overlooked! By the way, some of those prolific stamp-issuing African countries were in the Africa Pavilion, but not all of them. Which ones were represented? And did they have these stamps on sale in the Pavilion? I think they sold the Vatican NYWF stamps in the Vatican Pavilion (along with the postcard fly-to-Rome-and-back service), but don't know about other countries (other than the U.S. obviously being sold in the WF Post Office building). Yes most of the African countries sold postal items directly at the fair. 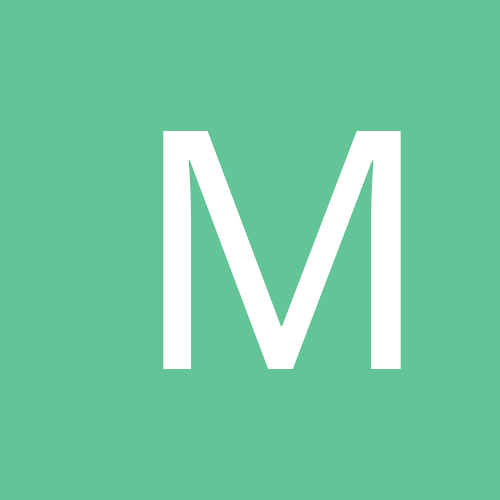 I'll provide a list tomorrow when I access my reference materials. Strange isn't it? Some of middle east, asia, and africa countries represented by the stamps issued for the fair in the 60's are in todays headlines related to terrorism and internal coups! Sadly no "Peace Through Understanding" lessons learned there. Great job on the stamps - very informative! Hey Randy, do you know anything about this? there's a quote from J.F.K. Haven't seen this one, though the date, October 17, 1965, is the final day of the best fair I attended during the 20th century! I think I can make out Mr. Zip's Philatelic Club on the bottom. The Zone Improvement Plan (ZIP) codes originated on July 1, 1963, so the World's Fair was probably used to promote Mr. Zip in conjunction with the fair's prominence in the media. If I recall, Mr. Zip was featured at the NYWF onsite Post office. I'll be digging into this a bit more. Thanks for the tip! This pictorial meter cover is from the '39-40 Fair. Do you have any similar meter cancels for the '64-65 Fair? Also, are you interested in photos of the kiosks at the Vatican Pavilion gift shop which dispensed the postcards which could be airlifted to Rome, cancelled at the Vatican City Post Office, and be sent back to the Fair visitor's home address? I've got a couple of photos. Somewhere I heard a story about the courier who carried the mailbag every day from the Vatican Pavilion to JFK airport to go on the daily Aeritalia flight to Rome which the Vatican had contracted with to carry this mail. Something about somebody wanting to get something into this mailbag that was important (and wasn't souvenir mail), and the courier waiting and waiting for it, and almost missing the Aelitalia flight. I never heard anything about these kiosks with the postcards, could you post a picture? No meter stamps like the 39-40 fair that I am aware of. I keep looking though. Yes, I'd like to see the kiosk images where the Vatican cards were sold. from Ray Dashner's scan of the Vatican Pavilion Guidebook - page 25. Read last sentence of the second paragraph. After reading that I went looking for a photo of the vending machines. Note also that the guidebook said machines (plural). The best view I found is right there in the Guidebook. I spotted what looks like two machines in front of (and at either end of) the Gift Shop. from Ray Dashner scan of Vatican Pavilion Guidebook, page 14. People leaving the Pavilion at the end of a Mass. Photo taken from above (the Chapel area). Appears to be a reflection through the upstairs glass- the lady standing there- but you can see people downstairs streaming out the door past the gift shop. The Vatican Pavilion also sold souvenir 35mm slide sets in clear sleeves of 4, with a blue and white top label. I believe you are zeroing in on either a backlit display of 3 such slide sets, +/or the vending kiosk for the same. ---edited with 2nd thought that perhaps sides have sort of writing desk surface - multi sided vending? Well, you could be right Rich- I see what you mean about that 'block' in the middle of the kiosk looking like slide strips. On the other hand, I have an original Vatican Guidebook which I pulled out and looked at that picture on page 14, to see if it's any clearer than Ray's scan. It's not MUCH clearer, but it is a little bit. And in that black end-panel on the kiosk, it looks VERY much like a postcard (or philatelic cover) that's displayed there. And the Guidebook DID say these postcards were sold from vending machines- it didn't mention anything else being sold from vending machines- and in the photos I haven't spotted anything else that looks like vending machines (not that we have very many views to look at!). Maybe these kiosks sold both slides AND postcards? Or maybe the slides were backlight displayed there, but you had to buy them at the Gift Shop counter? Also, it's my understanding that if you wanted the postcard mailed back to you from Rome, you had to address it yourself and affix a Vatican stamp to it. The Guidebook says an array of Vatican stamps were available at the gift shop. Now it doesn't quite make sense to me that they would make people buy their postcard at a vending machine, address it, then walk over to the gift shop to buy a stamp. It would seem to make more sense that they would have built both a postcard vending machine AND a stamp vending machine into the kiosk, as well as a slot to drop your postcard into. So that the kiosk would be a complete self-service stop. Plenty of unanswered questions, aren't there? ...Anybody know where the Vatican Pavilion employee list might be archived- perhaps it's in some library belonging to the New York City diocese? Anybody feel like "cold-calling" a former gift shop employee to ask about their memories of working there (and how the postcards were sold)? Just for everybody to get their positions- here's a view from the opposite angle compared to the other color ground-level photo. On the far left, in the distance, is the gift shop under the liturgical banners. Upstairs is the chapel. I can't see any of the vending machine kiosks in this picture (it's awfully tiny and grainy anyway). Those glass windows produced the reflection of the lady standing there (although the photo was taken on down, around the 'curve'). The stairs seen here were the way people streamed out when Mass ended, to head out the doors next to the Gift Shop. As the caption says, the kiosks in the foreground held exhibits of Cardinal Spellman's collections of coins and stamps, and were rotated periodically to show different representative groups of stamps & coins. A meter tape showing the Kodak Pavilion! Here is another one I have found, Travelers Insurance from September 22, 1965. Don't know if the 1964-65 years are rarer than the 1939-40 years, but they sure are harder to find. a regular stamp and the large enevolpe that the package came in has the same design of the building on the bottom in the middle with a the regular meter stamp for postage. Do you have a scan of it? Was this imprint (The pavilion w/ text) hand stamped? I used to work in printing, and I know that the color red is done on off days, and is quite a bit more expensive for envelope printing. Also the fact that the stamp seams off register abit (Doesn't line up exactly with the black return address. These little things matter big time in printing envelopes.) seams to indicate it's handstamped, if not part of the postal marking. Then again, it has no border line like handstamps often do, and printing hundreds of envelopes can produce a few off register. Travelers also had no problem paying for the extra price of red records. If it was handstamped, the stamps themselves would be a great potential collectable. Randy Lambertus was able to get a much better scan of the Kodak meter label, and I've put a slightly reduced size copy of it on my server- it should show up now in the place earlier in this thread where the rough grainy picture was. be due to the scan. Another one to ponder over. Do you think this is an official New York State government mailing? Unfortunately this is the only piece there is for reference material. I saw this one on eBay. With Albany town cancel, a state government entity is likely. Here's a couple of others. These are descriptions in a sales catalog from a British postal history dealer. I've e-mailed to see if we can get pictures. I take it that both of these are post cards.